To achieve this vision, Edmonton's downtown will need to be embraced and invested in commensurate with it being the heart of Alberta's capital city. A dynamic downtown is a key ingredient of a great city. “These awards recognize how our downtown plan will make the downtown even more vibrant, attractive, and sustainable,” says Gary Klassen, General Manager, Sustainable Development, City of Edmonton. The Plan designates the Downtown as a Special Area with its own set of unique land use zones. The zoning component of the plan, the Downtown Special Area Zoning Regulations, was approved by City Council on December 13, 2010. These zones will encourage a high quality, urban built environment. To help with implementing the CCDP, the Edmonton Economic Development Corporation (EEDC) struck a Blue Ribbon committee called the Downtown Vibrancy Task Force. This group is composed of 20 high profile business and community leaders. They are tasked with the objective of "developing strategies and action plans for accelerating development of a strong and vibrant urban core in Edmonton." Their work began November 2010. The project to prepare a new downtown plan began in 2006. At the time, it was anticipated that it would be a modest exercise involving some minor updating to the 1997 Downtown Plan. However, it became evident that a substantially new plan was required to address the significant amount of new development that had occurred in the downtown. A new Downtown Plan also needed to reflect new and emerging policy directions in the City’s Strategic Plan, the Municipal Development Plan and the Transportation Master Plan. Extensive consultation of draft versions of the plan has occurred since 2006, including numerous workshops, surveys, open houses and public events. The Edmonton Design Committee and a professional planning firm evaluated the work in 2009 and recommended ways to strengthen the plan, including testing of the proposed zoning and providing more details on how to implement the plan. The Planning and Development Department identified the final steps to complete the plan, which were approved on July 15, 2009 by the Executive Committee of City Council. The final stages included the creation of a Downtown Planning Team within the department, the hiring of a specialized team of consultants to assist the team in completing the plan, as well as the formation of a Downtown Plan Advisory Committee. 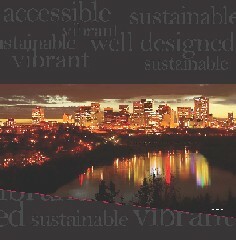 The Livable City Design group, formed by Cohos Evamy integratedesign, an Edmonton-based leading national multidisciplinary design team, was awarded a $400,000 contract in 2009-2010 to complete the Downtown Plan. The group was made up of nationally recognized designers and planners from Vancouver and Edmonton, including: HB Lanarc, Urban Plans Consulting, Hotson Bakker Boniface Haden, Carlyle + Associates, ISL Engineering and Land Services, and Cohos Evamy integratedesign. In addition, Steer Davies Gleave consultants provided expertise on LRT route alignment and related design elements. The group also drew upon the expertise of internationally known specialists in the areas of sports arena planning (NBBJ) and land economics (GP Rollo & Associates). The Downtown Plan Advisory Committee was established to provide input into the plan's final development. It was composed of the City Councillors for the downtown, and representatives from the Downtown Business Association, the arts community, social agencies, the downtown residential community, the design community, the development industry, downtown educational institutions and the province. The Capital City Downtown Community Revitalization Levy Bylaw and Plan (Bylaw 16521) was approved by City Council on September 17, 2013. Background information for the Capital City Downtown Plan. Land use regulations for achieving the objectives of the Capital City Downtown Plan. Link to page containing highlights and the draft versions of the Downtown Plan.